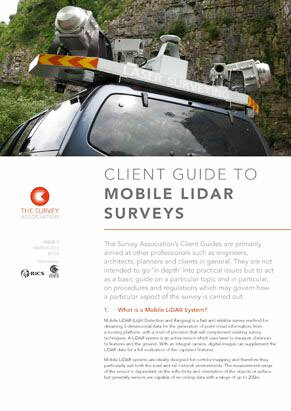 TSA has published a new Client Guide on Mobile LiDAR surveys. This Client Guide was written to help professionals understand what a Mobile LiDAR Survey is and what should be included in a Mobile LiDAR survey requirement specification. The guide covers the systems and equipment used, the typical outputs, applications and accuracies that can be expected from these surveys and the factors that could also affect the survey. It goes on to discuss the essential information that a client should consider when commissioning Mobile LiDAR surveys.